I dedicate this essay to the memory of my closest friend, Ven. 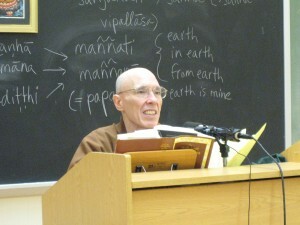 Bhikkhu Sumedha, who expired in Sri Lanka on Dec. 21, 2006, minutes after I finished writing it. I dedicate it to him as a true monk and visionary: cave-dwelling meditator, spiritual patron of the Peradeniya Teaching Hospital, genius artist, and one who always, even when on the brink of death, deeply remembered others. Thanksgiving is an American holiday that brings families and friends together for the purpose of strengthening old bonds. It is a time when people forget their cares and worries, return home–sometimes over long distances–and share a sumptuous meal. After a year when we each pursue our private interests, we come together and light the lamp of loving affection over a table spread with roast turkey, mashed potatoes, cranberry sauce, pumpkin pie, and other culinary delights. The early American settlers who first established this holiday originally offered their thanks to God for the bountiful harvest he provided them in their new home, so far from the European motherland. Nowadays, Thanksgiving has lost its religious overtones and has become a secular holiday celebrating prosperity and success. It symbolizes the unity of the family, the solidarity of the community, the forging of closer ties. Those of us who follow the Buddha’s teaching can also use the Thanksgiving holiday as a time of reflection, as an occasion for giving thanks. Since the Dhamma is non-theistic, we don’t give thanks to any God, but we can use the occasion to develop an attitude of gratitude: gratitude towards all the factors in our lives that contribute towards our fortune and success. In this short talk, I would like to mention briefly five things for which one might be thankful. I’ll speak for myself and then generalize. (1) I am thankful that I am a human being. When we reflect on how few are the number of human beings in the world compared to the number of other beings, we’ll appreciate the precious opportunity that human life provides. It may seem trifling, even ridiculous, to be thankful that one is a human being–for, one might ask, what else could I be if not a human being?–but if you reflect a little, you might see that it’s truly amazing that our own sense of "I," of being "this living being that I am," should be lodged in a human constitution. Just suspend for a moment your habit of taking your human identity for granted, and you can see that your sense of being "the `I’ that I am" could just as well have been connected to a dog’s body and mind, or a monkey’s, or a bird’s, or a fish’s, perhaps even an ant’s or a fly’s! To be a human being is extremely rare, yet human life is also precious because human life has such great potential: the potential to develop our intellectual and aesthetic capacities, our ethical sensitivity, especially our spiritual faculties. Consciousness of any sort is a seed, and the human consciousness is the seed that can unfold the highest realizations of purity, love, wisdom, and inner freedom. When we reflect in this way, we realize how crucial it is not to squander this precious human life, but to devote our efforts to our spiritual development. (2) I am thankful that I enjoy a reasonable level of material security. Here in this part of New Jersey, just about everyone has sufficient food, decent housing, and enough material resources to live comfortably and enjoy periods of leisure to pursue what interests them. This is a rare blessing. Throughout this world of six billion people, perhaps four billion are constantly struggling every day just to survive. They have to work long hours at tedious jobs, often dangerous jobs, just to earn enough money to buy food, clothes, and fuel. Many can’t afford adequate housing or medical care. But you have had a good education, live in a peaceful area, and enjoy at least a moderate standard of material affluence. (3) I live in a country where we enjoy fundamental social and personal freedoms. Our U.S. Constitution guarantees us freedom of speech, freedom of assembly, freedom of worship, freedom of the press. The present Administration may be cutting back on certain freedoms that this country has long cherished and long endorsed in the community of nations — particularly freedom from unwarranted search and seizure and from cruel and unusual punishment–but we still preserve the right to change the situation through our electoral process. If I want to, I can write essays criticizing our government, even our president, without fear of being arrested. Though almost all the people in governmental are Christians, I can practice Buddhism with perfect freedom and no restrictions are placed on my expression of my beliefs. In many parts of the world, people must conform to the prevailing religion of the country, even if they are privately convinced of the truth of some other religion. If they advocate another religion, they might even be beheaded. (4) I have encountered the Buddha’s teaching. As human beings, we need something more than material security, something more liberating than social and political freedom, something that leads to greater fulfillment than opportunities for personal creativity and self-expression. We need a path of ethical guidance that can help us make the right decisions in the face of tough personal dilemmas, a path of spiritual guidance that can show us how to realize our potentials for the highest wisdom, compassion, spiritual freedom, and peace. Among all the teachings known to humankind, that which stands out by its intellectual brilliance, ethical purity, and pragmatic versatility is the Dhamma, the teaching of the Buddha. The arising of a Perfectly Enlightened One is rare. The proclamation of the Dhamma is rare. Associating with good spiritual friends is rare. To have gained these three benefits is something for which one should be extremely grateful. (5) I have gained faith in the Dhamma and have found a good place to learn the teachings. Many people encounter the Buddha’s teachings but do not gain faith. They meet Buddhism as just one world religion among others; they see the Buddha as just one great religious teacher among others. Sometimes they become interested in the Dhamma, but that interest flares up and then soon fades away. However, when our interest leads to keen investigation; when investigation brings conviction; when conviction kindles steadfast faith in the Dhamma, and when we have found a good monastery to study and practice and knowledgeable teachers to guide us, then we have achieved an extraordinary blessing indeed. To these five general items worthy of thanks by any follower of the Dhamma, I add a sixth of my own: that I have gained the opportunity to become a monk in the Buddhist order and to have encountered good teachers throughout my years as a monk. Now, when we rejoice on Thanksgiving for our abundant blessings, we should also remember that there are many others in this world who don’t share our fortune. Rather than neglect them, we should also welcome them into the citadel of our hearts. If Thanksgiving is truly a family holiday, we might recall the Buddha’s words that it is hard to find a single person on this earth who has not, in some previous existence, been our mother or father, our brother or sister. Thus we should think of their misfortune as a matter of urgent concern to ourselves. (1) First and foremost, we should remember that our nation is at war. We are embroiled in a terrible war in Iraq, a terrifying war that was initiated under sham pretexts, that has been prolonged against widespread opposition, and that daily brings disastrous consequences. So far the war has claimed nearly 3,000 American lives and left many more young Americans disfigured and disabled for life. And so, while most American families could laugh and rejoice at their Thanksgiving tables, many sat at their tables with pain in their hearts and tears filling their eyes. But the impact of this war on the country where it is being waged is far worse than it is on America. Iraq is sorely divided, its infrastructure paralyzed, its cities in shambles. A recent report suggests that the war may have claimed as many as 600,000 Iraqi lives, most civilians including many women and children. On Thanksgiving day itself, over 200 Iraqis were killed in senseless sectarian violence. Bringing all this to mind, we should make a determination to press for an end to this war and to bear witness for the cause of peace, resisting all warfare and militarism as a solution to international and inter-communal conflicts. (2) Our planet’s climate is undergoing drastic changes. Climate change is occurring at a more rapid rate than was earlier believed to be the case, and the climate change presently taking place spells major calamities in the future: floods, rising sea levels, disappearing coastal lands, prolonged droughts, desertification, and dangers we cannot as yet even foresee. These in turn bring greater poverty, migration, exploding cities, and urban violence. The main culprit is the United States. Our country is the world’s largest consumer of carbon-based fuels, yet stubbornly refuses to cut down its production and consumption rates, refuses to accept limits on its right to exploit the earth, refuses to sign international agreements that might compel it to behave like a responsible adult. Yet we ourselves don’t have to follow our leaders, who are themselves pushed around by profit-seeking corporations. On our own we can follow a different drummer. Under the Buddha’s guidance, we can simplify our lifestyles, find contentment in the simple joys of life, and take "delight in renunciation." The Buddha teaches that craving is the root of suffering, simplicity the root of happiness; thus, by simplifying our lifestyles we can find deeper meaning and peace here and now while we behave more responsibly regarding the earth itself. (3) A large proportion of the world’s population goes hungry every day. While the U.S. over-consumes, billions of people around the world (including many poor people in the U.S.) have trouble finding enough food to sustain them through the day. When I lived in Sri Lanka some years ago, I had read that the average Sri Lankan family spends about three-quarters of the family income on food, and Sri Lanka was by no means near the bottom of the world’s poverty scale. In Central Africa, increasing desertification and locust plagues have resulted in annual food scarcities that take horrifying death tolls, claiming adults, children, and animals without distinction. Sufficient food could be provided very easily, yet our own country prefers to spend its resources on weaponry and military campaigns. The leaders of these poor countries, too, become embroiled in struggles for power that result in reckless expenditures on weapons and in brutal ethnic killings. But we should bear the poor and hungry in mind, live moderately, and give substantial donations to philanthropic organizations like CARE, Save the Children, Direct Relief International, the Tzuchi Foundation, and Sarvodaya. (4) Many people around the world are prisoners of conscience. They live lives of utmost deprivation locked away in prisons on charges they have never had the chance to challenge in courts, often simply because they dared to live in accordance with their conscience, or because they stood up against an autocratic leader or a tyrannical regime. There in prison they are often abused, humiliated, and tortured, and no one in the outside world even knows of their existence. Sadly, our own government, once the world’s leader in human rights, has recently used the so-called "war against terror" as a justification for enacting policies that permit almost arbitrary arrests and indefinite detentions, depriving prisoners of their basic rights to a free and fair trial. As U.S. citizens, we should stand up for the rule of law and the inviolability of the Bill of Rights enshrined in our Constitution, as applying to U.S. citizens and to those foreigners residing in our land. (5) In this world, people blindly follow the ten ways of unwholesome action. If we cast our gaze out upon the world, we see: (i) expanding waves of reckless violence, even high-ranking political groups resorting to murder as a way to eliminate foes; (ii) widespread disregard for the property of others; (iii) shameless sexual promiscuity; those in positions of responsibility showing no hesitation (iv) to lie and (v) to create divisions among others; (vi) angry denunciations spilling forth from the mouths of the powerful, (vii) senseless chatter from the mouths of entertainers; the minds of the multitude teeming with (viii) unrestrained greed, (ix) anger, and (x) wrong views. As followers of the Buddha who have been privileged to inherit his teaching, we should make some effort to sustain the light of his Dhamma in this dark world. Either by precept or personal example, we should teach the ways of wholesome action, the path of light and goodness that leads to all blessings, to happy living in this world, to higher rebirth, to the stages of samadhi, and to insight, enlightenment, and Nibbana. We should not be overly optimistic that we can kindle a spiritual revolution, for today the forces of darkness are indeed very strong. But with courage and persistence, we can hold up our candles in the night, and bring this light to those who have eyes to see, to those seeking an outlet from the tangle of suffering woven by greed, hatred, and delusion.